I’m cutting my losses on this one as pound bulls don’t seem ready to give up anytime soon. Here’s how it all turned out. I gotta admit, I was too eager to catch this short trade as I hopped in on a break of the double top neckline instead of waiting for a pullback. At that time, U.K. economic reports have been printing weaker than expected results, casting doubt that the BOE could maintain its rate hike bias. But instead of carrying on with its tumble, Guppy managed to hold its ground leading up to this week’s BOE statement. By the looks of it, most market participants are still counting on policymakers to maintain their votes from the previous meeting even though inflation dipped and Brexit risks are back in the spotlight. 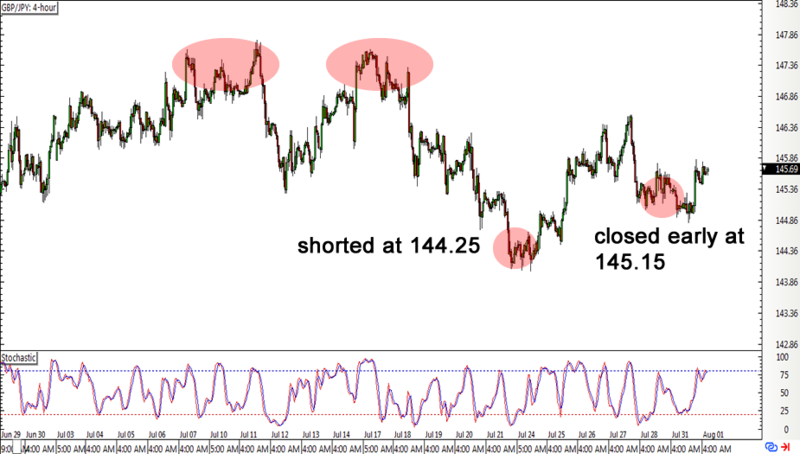 Price found resistance at the broken neckline, sending it back down to the 145.00 area. However, this also held as near-term support and the pair seems to be making its way back up again so I just decided to hop out. I realized that I’m not willing to hold on to this position in case the MPC minutes turn out more hawkish than expected again. PMI readings are also up for release and a rebound in any of the industries could also prevent the pound from sliding. Besides, the yen is also getting its share of safe-haven gains back from the U.S. dollar, which is currently being bogged down by chaos in the White House and concerns about North Korea’s missiles. Not so bad, eh? I’m just hoping that I won’t regret this decision in the event that the BOE backpedals on its upbeat stance. How do you guys think the event might turn out? Guppy seems to be bouncing off its long-term ceiling once more, and I’m seeing a small reversal pattern that might convince me to short. And I’m in! Guppy broke below the double top neckline and triggered my short entry order at the start of this week. Wish me luck!